You may have already been in that room. I know some of us have ! (Mark 10:21 KJV) Then Jesus beholding him loved him, and said unto him, One thing thou lackest: go thy way, sell whatsoever thou hast, and give to the poor, and thou shalt have treasure in heaven: and come, take up the cross, and follow me. 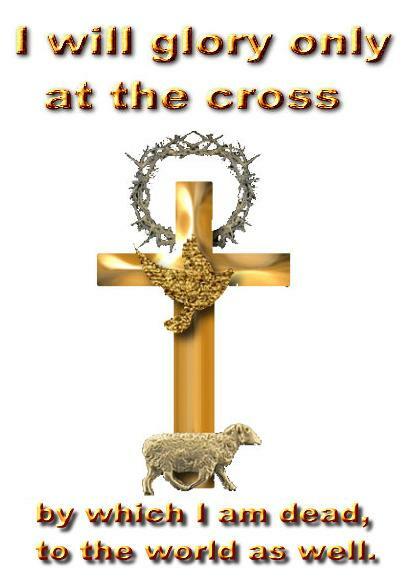 (Luke 14:27 KJV) And whosoever doth not bear his cross, and come after me, cannot be my disciple. (Luke 23:26 KJV) And as they led him away, they laid hold upon one Simon, a Cyrenian, coming out of the country, and on him they laid the cross, that he might bear it after Jesus. (John 19:25 KJV) Now there stood by the cross of Jesus his mother, and his mother's sister, Mary the wife of Cleophas, and Mary Magdalene. (1 Cor 1:17 KJV) For Christ sent me not to baptize, but to preach the gospel: not with wisdom of words, lest the cross of Christ should be made of none effect. (Gal 6:12 KJV) As many as desire to make a fair show in the flesh, they constrain you to be circumcised; only lest they should suffer persecution for the cross of Christ. (Gal 6:14 KJV) But God forbid that I should glory, save in the cross of our Lord Jesus Christ, by whom the world is crucified unto me, and I unto the world. (Col 1:20 KJV) And, having made peace through the blood of his cross, by him to reconcile all things unto himself; by him, I say, whether they be things in earth, or things in heaven. Lord God I do pray in jesus name that you will now , next take care of each and every activity that we do, and do it all in you, and let all this be for your praise and glory. Lord hold our arms and lead us when satan tries to take us astray. Lord even today amend each one of our broken hearts and remove all the satanic hindrances from our lives and be our shield. Lord remove also all the depressions we have of whatsoever nature and help us in all steps of our life. Lord , reunite our family, remove all satanic oppressions spoiling the relations and join the family members once again and give us the victory over that Satan. Bless us in our day to day life in your service, bless our family, and be with us. Lord I ask you in Jesus name to pardon all of the of sins committed by us and do send all your blessings on us and all of our family, do remove all sickness, remove all bitterness, ill fillings from our hearts and bring the reunion amongst our family members as well. Lord do also bless us with all joys in our heart and peace that you give to the believer by your son Jesus Christ. Lord now I thank you for hearing my prayers , and In the name of Jesus , my saviour I ask this for you as well. And this is the boldness we have in him, that if we ask anything according to his will, he hears us. And if we know that he hears us in whatever we ask, we know that we have obtained the requests made of him.